There is a little something for everyone in this years rookie wider receiver class. Whether your team needs a big, fast, high point guy or a quick, sure-handed slot guy or red zone threat, it is all there in the 2019 class. This class also has plenty of flaws. Everything from lack of route diversity to weak quarterback play to the dreaded injury bug. I am going to take a look at some ideal landing spots, this is not necessarily my top five wideouts but guys that would be great fits to be able to produce fantasy results early. Brown checks in with the best floor/ceiling combination in the draft in my opinion. 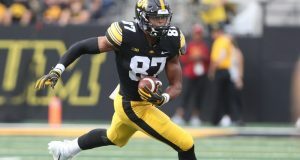 WR1 size, speed, and explosion at 6’ ½” 220 pounds with a 36.5” vertical and 4.49 speed who played in the slot and on the outside so he brings a lot of versatility to the field. Brown has been lost in the shuffle a little bit with teammate DK Metcalf’s combine performance. Don’t let that fool you though, Brown averaged 80 receptions and almost 1300 yards with 17 touchdowns. Brown is highly regarded for his work from the slot, here is a clip of Brown working from the outside. 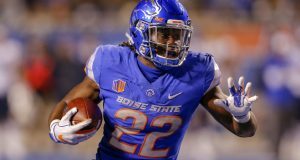 Adding the versatile Brown to a wide receiver corps in need of a star at pick 15 would be a real get. Washington has red zone threat Josh Doctson and rising slot guy Trey Quinn so adding Brown to take the true number one role for whichever quarter back they draft in 2020. There is a lot to like about N’Keal Harry’s game. He has size, hands, yards after catch ability, early breakout age and market share. Harry also comes with some questions about his speed and route running ability. Checking in at 6’2” 228 and running a 4.53-second forty-yard dash at the combine Harry has really strong ball skills to make those contested and back shoulder catches. In this clip, we See Harry line up to the right and running across where he has to go down and get the ball. Who doesn’t want to get drafted by Indianapolis if you are a wide receiver? Harry to Indy would slot him in as the wide receiver two behind TY Hilton and teamed with superstar quarterback Andrew Luck. With Devin Funchess on a one-year contract I expect Harry to show the Colts what it will be like if Funchess was fast and had good hands. Speaking of big and fast, Butler tipped the scales at 227 pounds and 6’5” tall with a 4.49 second forty at the combine. Blessed with high point ability to step right into a red zone role on day one Butler will need to overcome a tendency to drop some easy catches even though he often makes the spectacular catch. Of concern was Butler’s inability to beat out a very mediocre Allen Lazard at Iowa State. Butler’s film while sometimes showing highlight reel catches doesn’t seem to show 4.49 field speed. In this clip, Butler gets downfield and adjusts to the throw for a big gain. The Bills have a strong-armed quarterback and a need for weapons. The 6’5” Butler has great speed and a huge catch radius to help out the sometimes, how shall I put it, inaccurate Josh Allen. Spending pick 40 on Butler in pairing these two young potential stars would be a nice start to a resurgence in Buffalo. Grabbing Samuel at pick 43 to replace Golden Tate and to become the Edelman type player for Belichick disciple Matt Patricia is a great fit. Having Samuel play Mr. Inside to Kenny Golladay’s Mr. Outside will give Matt Stafford the weapons to bounce back after a down 2018. The straight (line) darling of the combine. Checking in at 6’3” 33228 pounds with blazing 4.33-second speed and 27 reps in the bench press Metcalf is a physical specimen. The downside is that he missed a lot of games with injuries and when he did play, he was very limited when in the routes he executed. Metcalf does somethings very well – get deep, high point the ball and burst off the line. He does other things poorly like change directions quickly or make double moves to get open. But there is clearly juice to his game that has maybe the highest ceiling but limitations that if not compensated for and improved may lead to the lowest floor in this group. In the clip below Metcalf get behind the defender downfield. When the defender tries to catch up, creating contact, Metcalf fights him off to make the catch. There is some variance in how the fantasy community and the actual NFL teams view Metcalf. 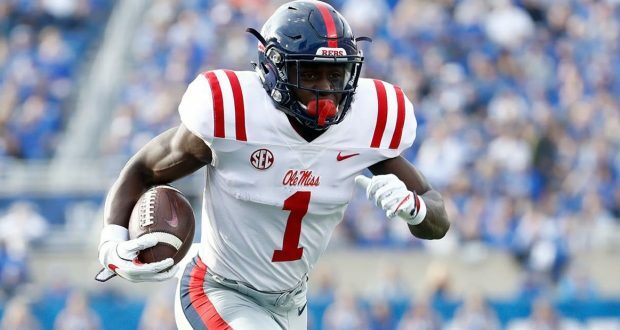 In a deep wide receiver draft Metcalf falling to pick 20 is a possibility. The Steelers traded Antonio Brown and brought in Donte Moncrief. Juju Smith-Shuster will be the all everything wideout and James Washington is going into his second season. Adding a big play field stretcher to go with a big armed Ben Roethlisburger looks like a nice fit. I will return next week with the tight ends and some landing spots that I would like to see. Until then you can catch me on twitter @culture_coach and on the Fantasy Football Roundtable podcast on your favorite platform. Grew up in Michigan and transplanted in Columbus as a teen. My dream Super Bowl would be the Browns and the Lions. I bleed Scarlet and Gray, class of 2010. Spent my 20's playing in hair bands (I had hair then). Love dynasty almost as much as my wife of 20 years. We have 2 boys, 13 (brains) & 8 (brawn). Run me down on twitter @culture_coach I look forward to talking with you.